2.Influencing play through the "1v1 Defensive Technique"
Practice begins with a six-position Flow Drill that works on various shooting and passing techniques from around the field. The drill is designed to make the passer increasingly aware of the receiver's location as well as their direction of movement. 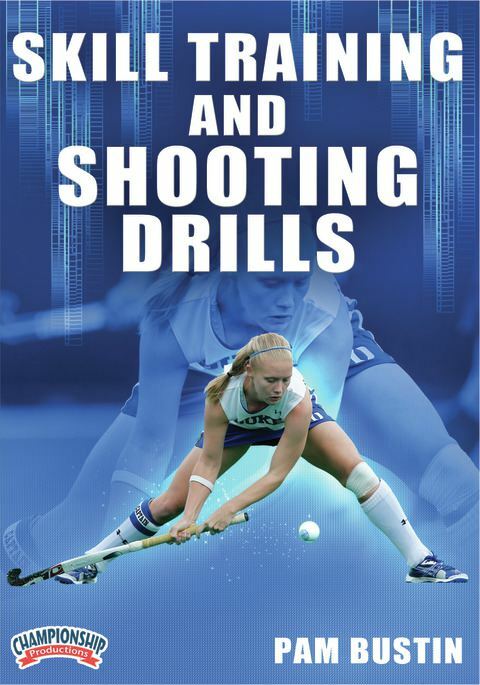 The exercise challenges the fundamentals of redirecting passes, staying down on the play, stick work and footwork. Coach Bustin concludes by critiquing the action of the players, reinforcing the strategy she's trying to encourage and soliciting player feedback. . The "1v1 Defensive Technique" section concentrates on the defender's skill at delaying and influencing the play through careful defensive techniques. Coach Bustin shows how to challenge offensive players with simple tips like closing quickly and breaking down when you trap, keeping your feet under your hips, running to close and using a drop [step] to get under the ball carrier. Using two players attacking the goal, the "Shots, Rebounds and Deflections Drill" shows how to position offensive players to receive passes, intercept rebounds and score with deflections from passes that originate from higher on the field. Focusing on play within the circle, this drill encourages increased movement in an effort to make something happen in front of the goal. Though it focuses on offensive movement, the defense also benefits from the challenge of defending against an offensive with an advantageous field position. Coach Bustin shares a variety of drills designed to build upon foundational skills and prepare players for game situations. Game-speed shooting drills give both offensive and defensive players with the opportunity to focus on their fundamental skills and challenge each other to a higher level of performance.